With the lower commodity prices and higher cattle prices, we have thought again about the sod based rotation idea that has been explored by David Wright in Florida and others. Here’s an excerpt from the UGA Bahiagrass publication. “Improvements in nearly all facets of crop production have been reported when row crops are grown after bahiagrass compared to following other row crops . This includes the most important factors to producers—yield and crop quality. Yet, there are other proven improvements that result from such rotations. In terms of soil environment, which greatly contributes to the sustainability of agricultural systems, factors such as reduced erosion, build-up of soil organic matter, root growth and depth of penetration by the succeeding crop, water infiltration, earthworm population, and soil tilth all change for the better. From a row crop standpoint, the most important benefit is usually from reduced incidence of numerous pests. Research results have shown a reduction in early and late leaf spot (Cercospora arachidicola and Cercosporidium personatum, respectively) diseases in peanut, decreased southern blight/stem rot/white mold (Sclerotium rolfsii) in peanuts and cotton, and fewer thrips (Flankliniella fusca), leading to less tomato spotted wilt virus (Tospovirus) in peanuts and tobacco. In addition, it is reported that peanut and soybean root-knot nematode (Meloidogyne spp. ), reniform nematode (Rotylenchulus reniformis), and soybean cyst nematode (Heterodera glycines Ichinohe) infestations may decline following bahiagrass since it is a non-host to these pests . Collectively, these factors can result in savings from reduced inputs such as a less frequent need for irrigation, elimination of one or more fungicide spray events, and potentially reduced applications of expensive specialty herbicides due to bahiagrass outcompeting weeds. In addition to the potential for improved yields and reduced inputs for the row crop enterprise, the inclusion of livestock can be a very successful capital venture that diversifies the farm operation and may serve as a profit center. This can buffer and insulate the farm operation from market fluctuations and, perhaps, catastrophic weather events. Even operations that do not wish to incorporate ownership of livestock could still benefit from similar systems (e.g., contract grazing, selling hay/seed of pasture grasses to nearby cattlemen, etc.). Though an economic analysis should be conducted to determine if a sod-based rotation using bahiagrass is economically feasible in a specific scenario, this may be a profitable rotation system for some farms in the Southeast. 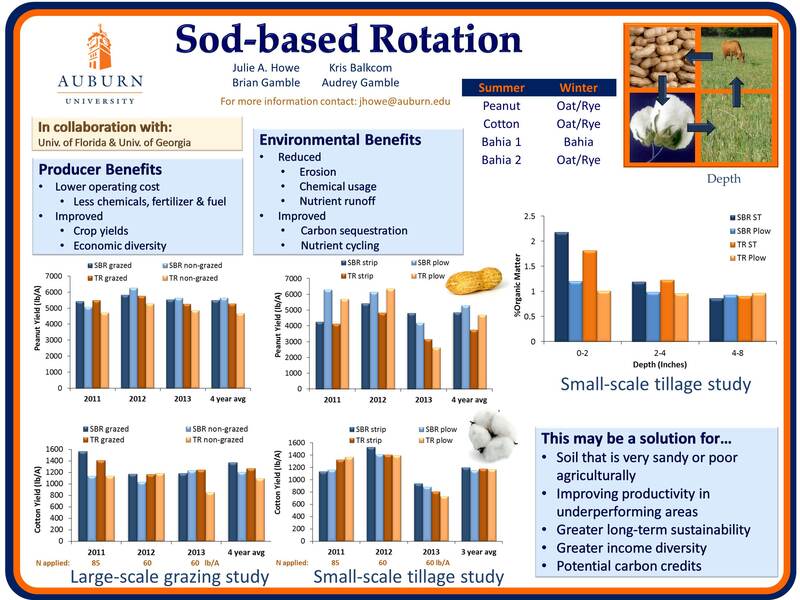 Here’s a poster recently presented by Kris Balkcom and others showing some research results. Posted in Agriculture, Forages, Livestock. Bookmark the permalink. Mitchell County Ag News was designed as the place for growers and citizens of Mitchell County to obtain the most up to date information concerning production agriculture, gardening, and 4-H Ag activities. For more information email Andy Shirley, Mitchell Agricultural and Natural Resources Agent, at ashirley@uga.edu.